Home > How do you measure a ’dose’ of nature? Evidence suggests that contact with nature benefits human health; measuring or quantifying those diverse experiences is the next step. We know that connecting with nature is good for our health, thanks to a growing body of evidence. 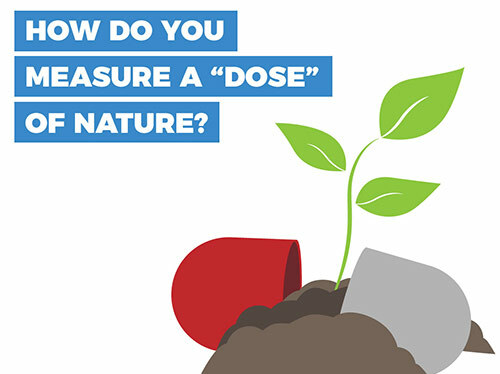 But how do we measure a “dose” of nature? Do we get the same benefits from having plants in our offices that we do from gardening in our yards? Is looking at a picture of the ocean the same as seeing it in person? Scientists say a research effort focused on questions like these has the potential to yield public health insights. Howard Frumkin led the research team. A team led by Frumkin, a professor of environmental and occupational health sciences, identified research domains that will frame a study of the health benefits of nature contact. That framework was published in Environmental Health Perspectives. Scientists emphasized studying the links between nature and conditions such as obesity, cardiovascular disease, cancer, depression and anxiety. Identifying mechanisms responsible for observed health effects is “a central aspect of health research,” they wrote. For example, how nature reduces stress and what role the human microbiome plays. Research should focus on populations at particular risk, such as children and the elderly. Kids are spending more time than ever in front of screens, while park visitation, camping and outdoor play have all declined in recent decades. “As children today spend considerable time indoors, sedentary and in front of devices, it is important to have rigorous research that helps us understand the preventive and therapeutic benefits of nature for children’s health and development," said co-author Pooja Tandon, a UW adjunct assistant professor of environmental and occupational health sciences. Also, evidence has shown that access and preference toward nature and its benefits vary by socioeconomic status, ethnicity and other demographics. The key, Tandon said, is to study how benefits vary for disadvantaged groups and what barriers and consequences exist. Co-author Pooja Tandon is a UW adjunct assistant professor of environmental and occupational health sciences. Nearly four in five Americans and more than half of the global population live in cities, so understanding urban greenspaces is important. More specifically, how often people use greenspaces, ease of access, and in what ways they promote physical activity and social interaction. A better understanding of what works best, Frumkin said, will inform decision-makers in parks and recreation, urban and land-use planning, landscape architecture, interior designs, education, and healthcare, among others. Challenges exist to information gathering. For one, exposure measurements often don’t capture variation in how people experience nature – for instance, looking out a car window to see mountains versus hiking a trail. It also is hard to quantify what a person experiences during an episode, or dose, of nature contact. Enhancements in epidemiologic research can help build evidence on the nature-health connection. Scientists suggest using large, ongoing cohort studies and innovative data sources such as Google Street View and social media. The UW researchers represented the Center for Creative Conservation, the College of the Environment, and the departments of psychology, pediatrics and chemistry. Other contributors included The Nature Conservancy, Seattle Children’s, U.S. Forest Service, Willamette Partnership, Stanford University’s Center for Conservation Biology, and The Natural Capital Project. Co-authors are Gregory Bratman, Sara Jo Breslow, Bobby Cochran, Peter Kahn, Joshua Lawler, Phillip Levin, Pooja Tandon, Usha Varanasi, Kathleen Wolf and Spencer Wood.